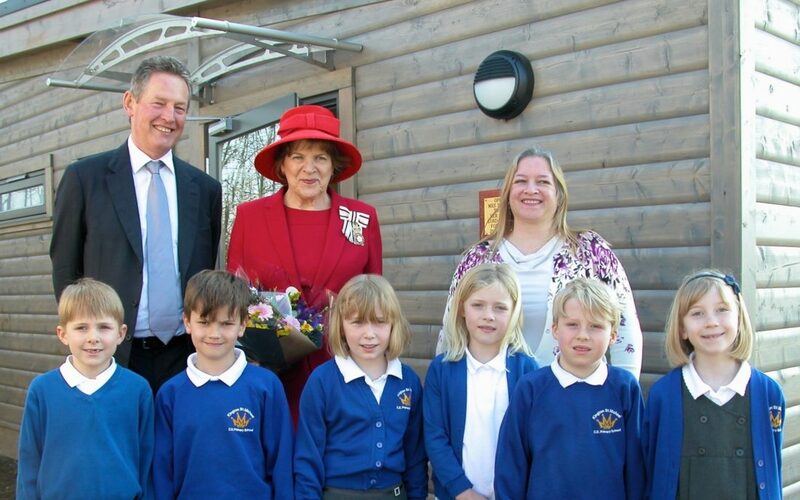 PUPILS at Kington St Michael CE Primary School near Chippenham have become the first in the country to take their seats in a new style of modern classroom made by Norwegian Log Buildings. The brand new Norwegian Log Contemporary building was made and built off site at Norwegian Log’s Berkshire manufacturing base in four modular sections. Erected in just two days on the school grounds and so causing minimal disruption to staff and pupils, it boasts a fully-fitted 45m2 classroom, lobby and two toilets and is now home to the school’s Year 2 and 3 class. Thank you for our classroom! The striking solid log building is the first classroom to be made by Norwegian Log as part of its contemporary range. Using traditional log construction methods, gleaned over 30 years, the firm is branching out into providing much larger transportable buildings – all with a modern design twist but with the same durability, acoustics and natural thermal insulation. Finished in a natural silver hue with large roof lights and windows, the Wiltshire classroom is flooded with natural light and sits on the edge of the school’s grounds. The new building has proved a hit with pupils. “The children love it. It has a fantastic atmosphere, a really nice learning environment and the pupils appreciate how lucky they are to have it,” she added. It has also solved a space issue at the over-subscribed school, rated Outstanding by Ofsted, which has grown rapidly from 76 pupils just eight years ago to 120 currently. “We’ll now be able to redevelop other areas of our school into a music room and library so the building is helping not just one class but the whole school,” Tracy said. Managing Director Nick Forrester said: “We’re delighted Kington St Michael’s pupils have given their new classroom the thumbs up. Tracy and her team wanted a classroom building that looks good and would last and we’ve delivered exactly that,” he said.